Seattle-Tacoma International Airport has become a whole new kind of hub—for more than 600,000 flying insects. Seattle nonprofit The Common Acre (commonacre.org) worked with local bee-hugger organization Urban Bee Company (urbanbee.org) to install 16 honeybee hives at three locations in the scrub near the runways as a way to help combat the massive wave of colony collapse that’s killing off millions of essential pollinators. 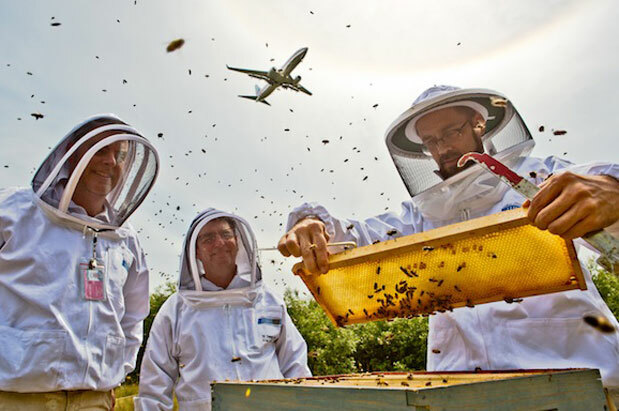 Bob Redmond, Seattle beekeeper and founder of Urban Bee Company (which will maintain the hives), was inspired by a similar project in Chicago, where an employment-training program taught ex-cons how to tend to beehives at O’Hare International Airport. “My interest was more about land use and public food policy,” Redmond says. He first approached the Port of Seattle with his idea in late 2011, and the hives were installed this spring. “I believe this is the second major airport in the nation to host honeybees, and the first to do it specifically because of conservation reasons,” Redmond says. Called Flight Path, the project also will hold public events to raise awareness about how honeybees impact the food system, and in January, an art exhibit—featuring pollination-themed work by esteemed Seattle artists Mandy Greer, Jason Puccinelli, Celeste Cooning and David Lasky—will take place, naturally, on Concourse B.